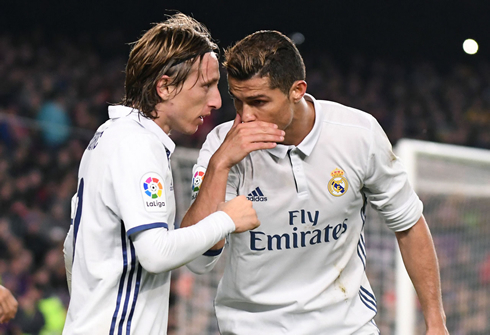 Real Madrid unbeaten streak survived El Clasico as the Merengues managed to leave the Camp Nou with a 1-1 draw against Barcelona. 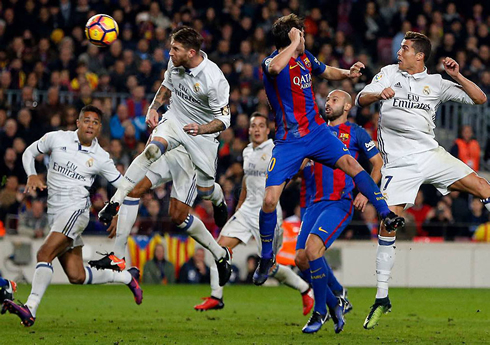 Suárez scored first for the hosts, but Sergio Ramos late equalizer made sure the Blaugrana will stay 6 points behind Madrid in La Liga table. 33 Games! Real Madrid are now 33 games unbeaten. Some have called it luck, but luck doesn't fall your way 33 times in a row. Against what many have desired, Zinedine Zidane is having a massive impact on the club. Today was a perfect example, a 1-1 draw may not go down in the history books as the most impressive result, but the fightback from Madrid is something that we haven't seen much of in recent years in the league. Zidane's teams are resilient and they continue to fight until the last minute. 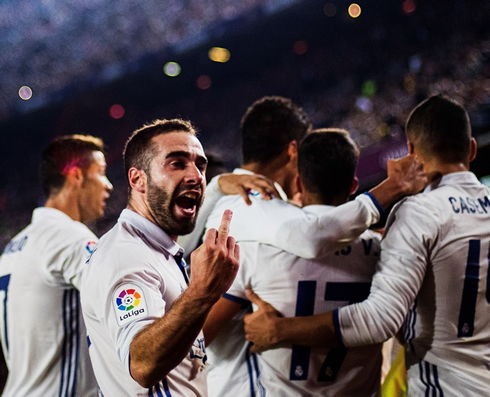 Of course, the remontada is a staple of the club, but since Zidane has taken over, Real Madrid's confidence has grown ten fold. It was always going to be a tense affair. With Iniesta missing from the starting lineup and the likes of Bale and Kroos missing for Madrid, the match was a bit dimmer than usual. However and with the star power on display, it was always going to be an enticing encounter. 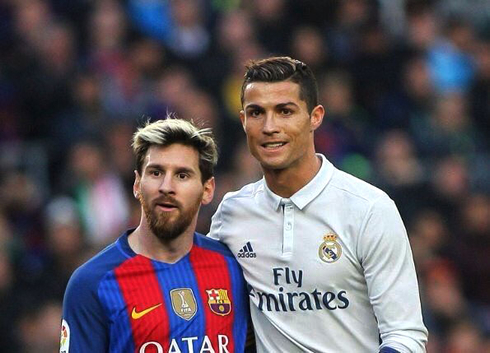 And of course, there's Ronaldo and Messi, but those two wouldn't steal the show today. Real Madrid lined up in their 4-3-3 but with a 4-4-2 twist. Vazquez, deputizing for the injured Bale, played along the right but with the plan that he would often drop back into a more defensive position if the situation permitted. The game started out with high-intensity pressing from both sides. Barça looked comfortable early on, but soon Madrid began to make their stamp on the game. Still, the game was reduced to a series of half chances. The Merengues were tactically brilliant, stifling out chances when needed. Modric in particular was everywhere making interceptions and keeping the play moving. There were some half-hearted penalty shouts, but not much else as teams would both go into the break at 0-0. Real Madrid's defensive discipline would slip badly in the second half. Barça would go up 1-0 thanks to a Luis Suárez header from a set piece, but more worrying was Madrid's indiscipline in the midfield. Too much pressing and too much space was afforded. Iniesta, who came on in the second half, enjoyed the faster tempo and picked Madrid apart at times. Barça had a golden chance to put the game away for good when Neymar cut inside and found himself free near the edge of the six-yard box. But shockingly, the usually clinical Brazilian blasted his shot over the bar. Real Madrid took that as a sign and continued to attack, but nothing would bear fruit. Marcelo, in particular was everywhere attempting to find any possible avenues for a cross into the box and dribbling well under pressure when needed. And it was Marcelo's timely dribbling that would lead to the last minute equalizer. 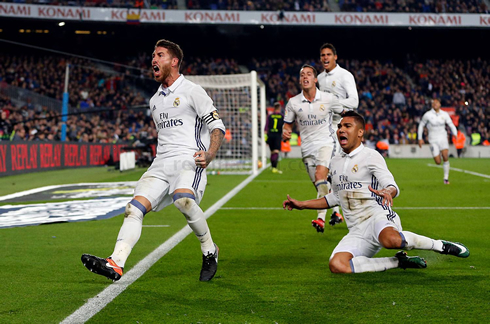 In the 91st minute, with both teams almost resigned to the result, Captain fantastic (who else) Sergio Ramos rose to power a header through past the outstretched arms of Ter Stegen. Jubilation! Again, Mr. 92:48 saved Madrid's blushes with an important late goal. 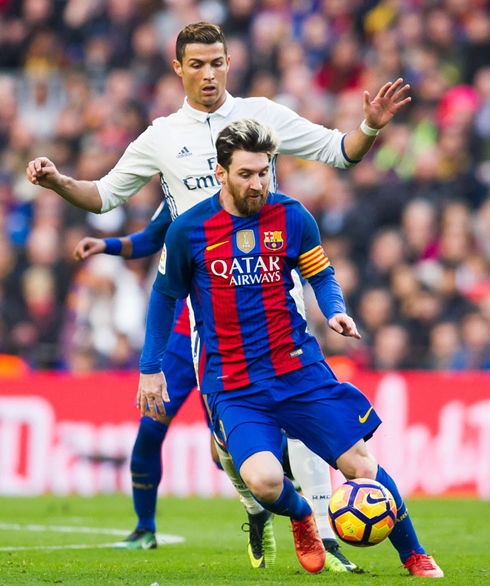 Barça would give Real Madrid a bit of a heart attack a few minutes later, when Casemiro had to clear the ball off the line, but Madrid would hold on and maintain their lead over Barcelona in the league. Not the best result, but considering where both teams currently rank in the standings, it's a great result for Madrid. Cristiano Ronaldo next game is a Champions League fixture, on December 7 of 2016 against Borussia Dortmund. 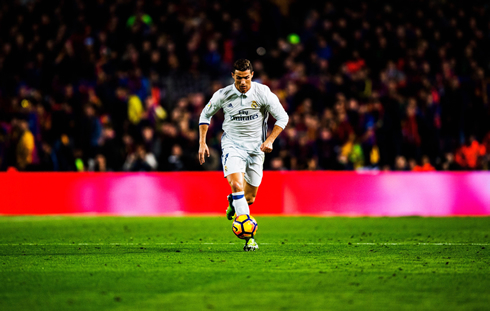 You can watch Juventus live stream, Real Madrid vs Borussia Dortmund, Barcelona vs Borussia Monchengladbach, Everton vs Manchester United, Bournemouth vs Liverpool, and Lazio vs AS Roma, all matches provided from our soccer and football game pages.